Backdraft is currently the best choice for most situations, particularly when your Artifact is past 31 traits. It is the best option for cleave and multitarget at any Artifact level. Roaring Blaze is a competitive option for single target, particularly below 31 Artifact traits. Only reason its not used on progress etc is because of the clunkyness of the spell. You need to plan a lot for it to do good DPS which you don't usually get to do on progress. If you do play with it, you should aim to buff Immolates with atleast 2 conflags and every other immolate with 3 Conflagrates. Shadowburn should be avoided in its current state. Empowered Life Tap is the best option if theres a lot of AoE in a fight or you dont have really good gear with specific legendaries. It buffs all your damage which you do by 10%. Eradication is the strongest option when using feretory of souls, Tier 19 2 Piece and 28% Haste build. It becomes even stronger if its a 2/3 target cleave fight. Reverse Entropy isn't as good as the other 2 talents however it can be good for new warlocks as it doesnt change anything to the gameplay and also requires you to never have to worry about mana. Demonic Circle is the best choice for 99% of the fights, its a good DPS increase if used properly as it reduces movement. Can also be used smartly is certain situations, definitely the best choice most of the time. Mortal Coil can be used as a heal which can be useful, it does have travel time however so its not instant. This spell can also be affected by Havoc. Shadowfury can be really useful in mythic+ for an extra stun but rarely ever used in raids. Soul Harvest is the best option for 1-3 targets and its gives Warlocks an extra CD for when bursting/pushing damage checks is required. Burning Rush is best 90% of the time as Warlocks have no baseline movement speed and are very slow without Burning Rush. It is also a good DPS increase as you can move faster and helps get out of lethal mechanics which will 1 shot you. Dark Pact is very potent when there's big damage coming out every 1 minute or when you need to soak something and require a big shield. Grimoire of Supremacy is never used. Its not worth to lose the cooldown of Summon Doomguard and the cooldown you get from Grimoire of Service. 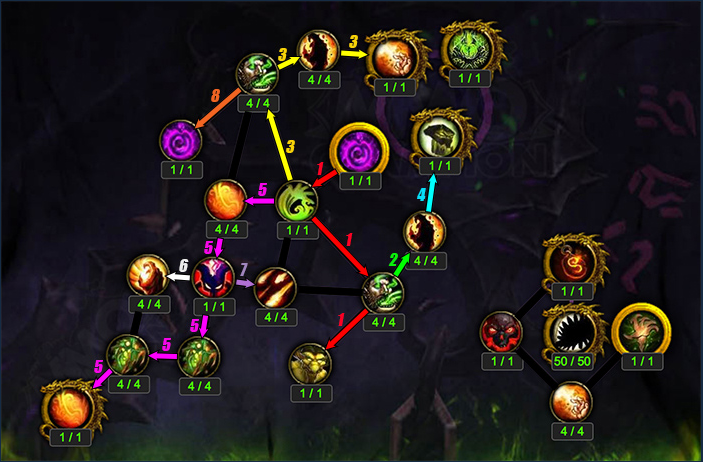 This talent is only good if you want to level as a warlock and use the Infernal to tank the quest mobs for you. Grimoire of Service is always used in raids at the moment, it offers the best single target DPS and also offers another DPS burst cooldown which is perfect for progress. Grimoire of Sacrifice is best for low level Mythic+ when you're pulling a lot of mobs at once. In raids its only good if there's 4+ targets stacked for a long time and boss damage isn't important. In Nighthold I didn't use it once, however it low level Mythic+ blasting it can be pretty good. Channel Demonfire is currently very good for single target without the feretory of souls. It can also be very good in low level m+ when pulling a lot of mobs lined up with Cataclysm. Wreak Havoc is used to maximize big damage on 2 targets. This is what makes warlocks cleave so potent and strong and should be taken whenever you think you can use it enough to increase your DPS. This should be used on any 2/3 target boss. Soul Conduit can be a strong option for sustained AoE damage with the Rain of Fire buffs however it comes with a lot of RNG. Its very strong Single Target if it proc's a lot with Eradication. At the end simply max out the damage increasing trait. And here's the 7.1.5 version. I took the image, with permission, from the Icy Veins guide, which I help maintain. Burning Hunger for Immolate critical strike chance. Chaotic Instability for Chaos Bolt damage. Fire and the flames for incinerate cast speed. Master of disaster for incinerate damage. Soulsnatcher for Chaos Bolt shard refunds. However I would like to add that Destruction is all about weapon Ilvl so bear this in mind.